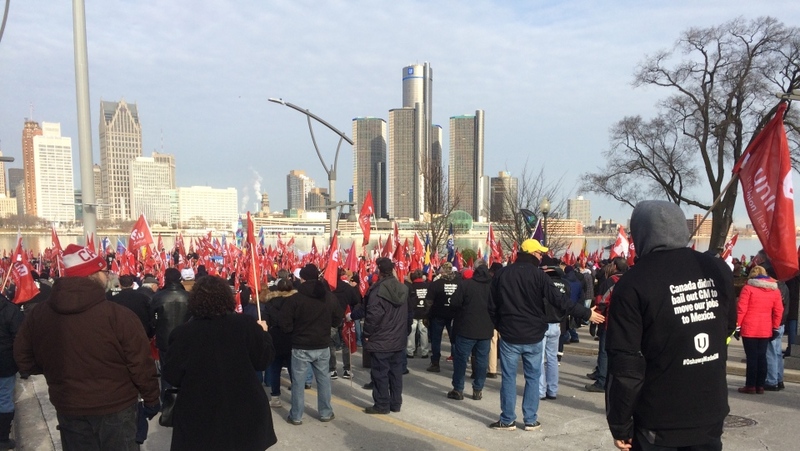 More than a thousand people gathered for a General Motors rally along Windsor’s riverfront on Friday. 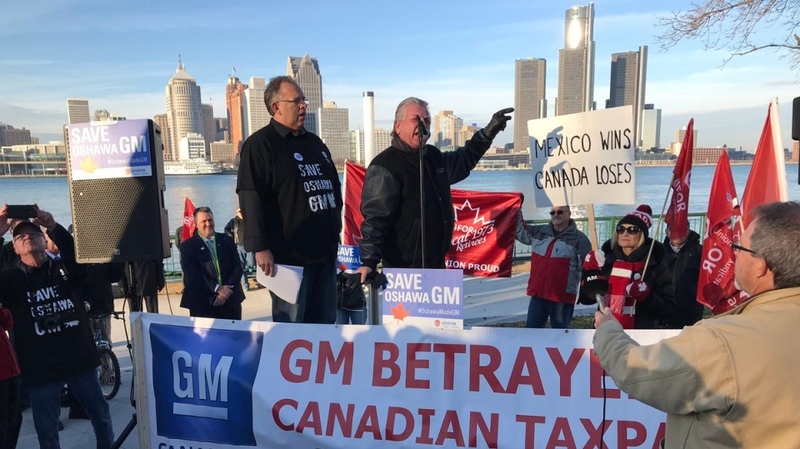 The rally was organized by Unifor and the Windsor and District Labour Council in support of GM workers who are losing their jobs in Oshawa and autoworkers across Canada. Unifor president Jerry Dias proclaimed they are not giving up the fight. “The ship hasn’t sailed, because we are not accepting the decision,” said Dias. The protest was held on Windsor's waterfront because investors were meeting across the river in Detroit on Friday. The rosy profit angered Dias and GM workers. Dias added he has a message for GM. 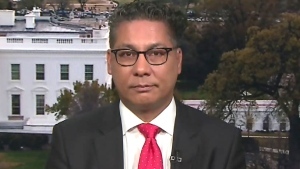 “The message has to be - if you want to sell here, you’d better build here,” says Dias. 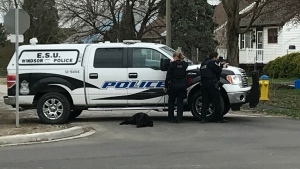 He also had a message for Prime Minister Justin Trudeau and Ontario Premier Doug Ford. “I am not only requesting a meeting, we are demanding a meeting,” says Dias. Greg Moffatt, plant chair with Unifor Local 222 at GM in Oshawa, also addressed the crowd. "Shame on you General Motors,” said Moffatt, who also thanked Canadians from coast to coast to coast for standing behind the Oshawa workers. The union demonstration took place on the same General Motors strengthened its pretax profit estimate for 2018 and predicted even stronger performance for this year. Chief Financial Officer Dhivya Suryadevara said restructuring efforts will help GM's bottom line in 2018 by $2 billion to $2.5 billion, with a total benefit of $4.5 billion in cost savings and $1.5 billion less in capital spending by the end of 2020. Labour Council President Brian Hogan tells CTV Windsor they can’t watch GM leave Oshawa. “Us as taxpayers, we bailed out GM, and now they’re bailing on us,” said Hogan, referring to the $13.7-billion paid by the federal and Ontario governments in 2009 to rescue GM Canada and Chrysler Canada from potential bankruptcy. 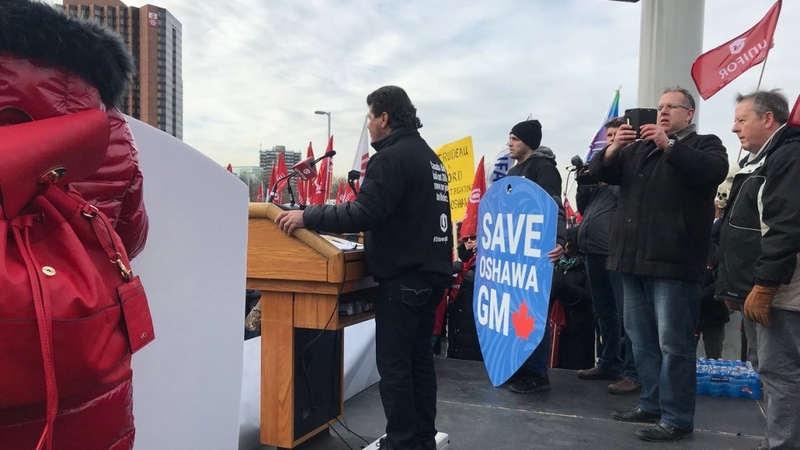 Hogan said the rally is meant to support the more than 2,500 employees at the GM plant in Oshawa who will lose their jobs when the plant closes in 2019. Hogan added they are also rallying to bring attention to the impact the move will have on Ontario and Canada. Hogan tells CTV Windsor both the provincial and federal government can do more for GM workers. “If you're for the people, than you've got to roll up your sleeves and talk to these corporations who are making billions of dollars and dismantling our tax base and dismantling a great community like Oshawa,” says Hogan. Busloads of autoworkers from across Ontario were in Windsor for the rally, including hundreds of employees from Oshawa. Earlier this week, GM rejected Unifor’s plans to keep the Oshawa plant open past 2019. Dias said the automaker has picked a fight with the entire country. 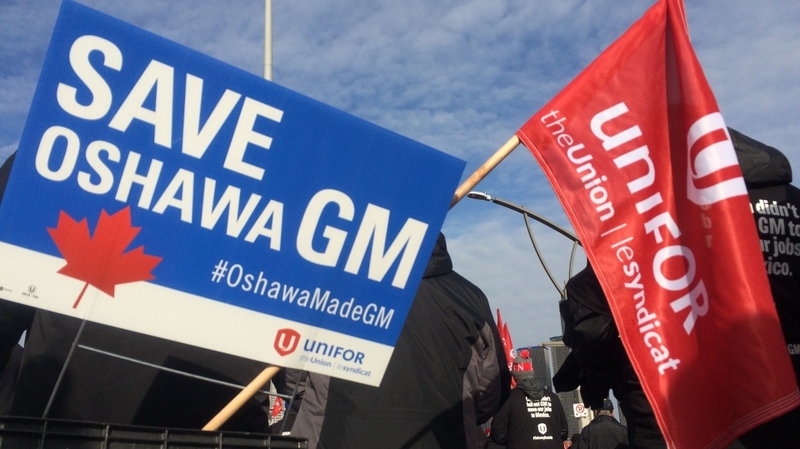 GM officials said they responded to Unifor proposals from December and invited the union to begin constructive discussions on transition strategies and supports for Oshawa Assembly workers who may elect to either retire or pursue new careers following their work for GM. GM detailed some of these transition supports in a letter to Unifor. On Dec. 14, GM Canada announced millions of dollars in training support for Oshawa Assembly employees who wish to transition to new careers but may require additional training. GM officials say they have been contacted by more than 20 large employers across Durham Region and the GTA interested in hiring GM workers for up to 5,000 positions they plan to fill over the next two years. Unifor has been running ads critical of the company's decision and highlighting that it accepted $11 billion in bailout funds from Canadian governments in the financial downturn. The union has also emphasized the many spin-off jobs that depend on the Oshawa plant and the wider impacts of its closure on the economy.